Easter Candy For Easter Egg Hunts – Because Sweet Treats Make For Hoppy Hunters! Whether you’re planning an Easter Egg Hunt for your kids, your neighborhood, or your entire town, you’ll need some pocket-friendly pieces at pocket-friendly prices to satisfy every sweet tooth that arrives ready to ransack the field! And BlairCandy.com just happens to have that Big Bunny-approved candy that will have kids racing for colorful eggs full of awesome! 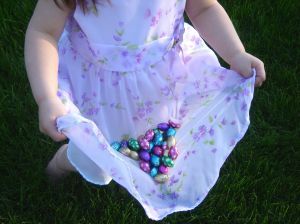 Easter Egg Hunts Made Easy! If you’re looking for something a little bit different, consider these Jelly Bean Beans. Taking their style from the classic pop-open plastic egg, these are shaped like a jelly bean instead, and come pre-packed with jelly beans as well! Each box is stocked with 48 pretty pastel containers, perfect for hiding indoors or out. Another tempting twist on a classic, these Milk Chocolate Covered Peeps are music to your mouth. Ever wondered if it was even possible for a Peep to be more delicious? Here’s your mmmilk chocolate answer! 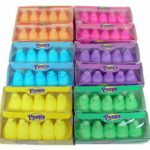 Each Peep is individually wrapped, so even if they won’t fit inside an egg, they also won’t get dirty in the short moments before they’re delightfully discovered. Want special prizes for ‘winning’ eggs or Treat Bags? At my favorite annual Easter Egg Hunt from my childhood, there were actually only a small amount of colorful candy-filled eggs in the field. Most of the prizes were found in treat bags, which all included some sort of candy, from Candy Coins to Dubble Bubble. But the special ‘winning’ bags also contained a certificate that let the lucky kid know a special prize was waiting for them after all the eggs and treat bags had been discovered. Sometimes the special prize was something larger, like a baseball bat or doll donated from a local business. And sometimes it was something smaller but still fantastic to win, like a Milk Chocolate Bunny. Honestly, it didn’t matter much what that certificate won me. The real prize was walking toward the man in charge of the special prizes with a ticket in my trembling little hands. At that moment, the whole world stopped until the prize was presented to me. Even if almost every other kid had a ticket as well…I was the Easter Egg Hunt Winner! 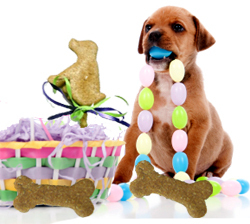 Make Sure The Easter Bunny Remembers Your Beagle, Boxer or Bichon! There are lots of things to love about holidays, from friends and family visiting from out of town, to marvelous meals full of food , fun and laughter. But my favorite thing about holidays is the selflessness. It’s as if all of a sudden we are overcome with a desire to share and care – there’s no one fighting over the bigger half, no one’s frown going unfixed without someone trying to make it a smile. We’re more generous, and happy to be so! We’re more ourselves, really; or who we might be were it not for all the stresses and messes of everyday life occasionally making us a bit cranky. We’re hugging, we’re reminiscing, we may even be glowing – and as the conversations continue, and the dog wanders into the kitchen while we cook, we smile down at our furry friend and give her a treat from the table. After all, it’s a holiday and she’s such a good girl, what harm is there in one piece of chocolate? Unfortunately, quite a bit of harm. The toxicity levels for chocolate in dogs varies by the type of chocolate and the size of your dog, but the potential for them getting sick is definitely not worth the risk. It actually takes a very small amount of chocolate to affect dogs negatively in many major ways, including an increased heart rate, vomiting and muscle tremors. In the case of accidental ingestion you should contact your Vet immediately, but prevention really is the best prescription, so take time to ensure those sugary sweets you and your children will be enjoying are out of Rover’s reach. And, of course, make sure you have some Dog Treats stashed away for your pooch to enjoy the day! At Blair Candy, we are all about bringing a smile to every face in the house, including the fluffy, furry ones that are always oh-so-eager to bring a smile to us all year round. Happy Easter to Your Family From Ours! Candy Gift Baskets – If You Build It, They Will Nom! There are plenty of pre-packaged candy gift baskets on the market to choose from, but they all share the same two problems; They are very expensive, and they don’t contain exactly what you want. Not getting exactly what you want is bad enough, but to pay a fortune for it on top of that – not an appealing idea! Candy is meant to bring joy, not compromise. 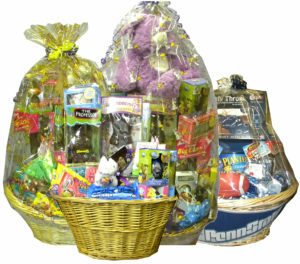 And at BlairCandy.com, you can pick the perfect sweets and treats to fill your basket, and give a gift that’s good to the last gumdrop! Start With A Flavorful Foundation – Penny Candy isn’t only perfectly-priced and delicious, it also makes for a great filler for the bottom of your basket. Consider starting with a bag of Wrapped Candy pieces, available in tons of tempting flavors. With 240 pieces per bag, and a pocket-friendly price of just $2.75, building a base of candy for your basket will not only be tastier than choosing fancy paper or straw, but cheaper, too! Add Your Large Candy Selections – These will, of course, depend on the basket you’re putting together. If you’re making an Easter basket, now would be a good time to add your Milk Chocolate Easter Bunny or White Chocolate Cross. For a ‘Just Because’ or birthday gift basket, our Giant Gummy Bears or tin of Chupa Chups might go in next. Just work them into the penny candy base you’ve built, and they’ll be supported by their candy cousins! Put In The Finishing Touches – Find candy that fits the occasion, or simply candy you know they’ll love. Still taking advantage of the supportive power of your pile of penny candy, nestle in some Lollipops – stick down, sweet side up! Or find a few clever creations from our novelty candy selection, such as the oh-so-cool Icee Spray Candy. Play with different candy sizes, colors and flavors to add dimension and deliciousness, and tap into your creativity to make your basket uniquely ‘you’. There is no right or wrong way to make your gift basket its best, so enjoy the process as much as they’re going to enjoy their sweet surprise! ‘Egg’celent Easter Candy To Fill Baskets And Bellies! There are tons of terrific holidays that we can’t wait to celebrate, from Christmas to Valentine’s Day to Halloween. And while these holidays bring chocolates alongside presents, conversation hearts alongside love poems, and enough candy corn to satisfy our sweet teeth for days alongside clever costumes, none can capture the abundance of delectable delights that Easter promises! If you’re lucky enough to have a little one in your life, you’ll probably soon be spending an evening packing a pretty basket with Easter straw, and tucking enough temptations inside to leave your child falling asleep with a sweets-satisfied smile for weeks. I remember the excitement of Easter morning well, an excitement only rivaled by that of Christmas morning. Rushing down the stairs as fast as my footie pajamas would allow, I began the greatest, most important hunt in my young world – the hunt for my Easter Candy. With a determination rarely seen in children, my mind darted between thoughts of Jelly Beans and Chocolate Bunnies, eagerly imagining the perfect pleasure of sinking my still sleepy teeth into the first Marshmallow Peep of many to come! And when that magic moment arrived, when the correct cupboard door was opened or blanket lifted, I was as close to bliss as anyone ever really gets. There is no love or hate in that moment – no war or peace – there is just a basket of Easter Candy and a sense that all is well. The Bunny was here, the Bunny was generous, the Bunny is my friend! I would proceed to snuggle up on the couch with the basket in my lap and switch on morning cartoons. No one dared challenge my television selection – Easter morning and all that goes along with it unspokenly belongs to the children. My older brother would wake awhile later and beg a Chocolate Cross or Cradbury Crème Egg, my sugar-soaked mind obliging his wishes as I continued my candy and cartoon coma. And an hour after that, we’d all head to Church, where it was difficult not to notice the get-up-and-go of all the kids. Legs excitedly kicked against pews as the sugar settled in while mothers hushed the chattering children relaying stories of their Easter basket’s bounty to nearby friends. We were told in hushed tones, “It’s Easter! Be respectful!” But we smiled inside and out, because we understood possibly better than any adult ever could both the true and the tasty meaning of this glorious holiday.